Guardians of the Galaxy #11.NOW Writer: Brian Michael Bendis Artist: Sara Pichelli. “Guardians of the Galaxy” joins the All-New Marvel Now! fray with the second part of “The Trial of Jean Grey,” continued from last week’s “All-New X-Men.” This issue shows the Guardians’ side of things as the team races to Earth to prevent the Shi’ar from capturing young Jean Grey to make her pay for her future self’s crimes. This issue is a great jumping-on point as we count down the months till the “Guardians of the Galaxy” film debuts in August. 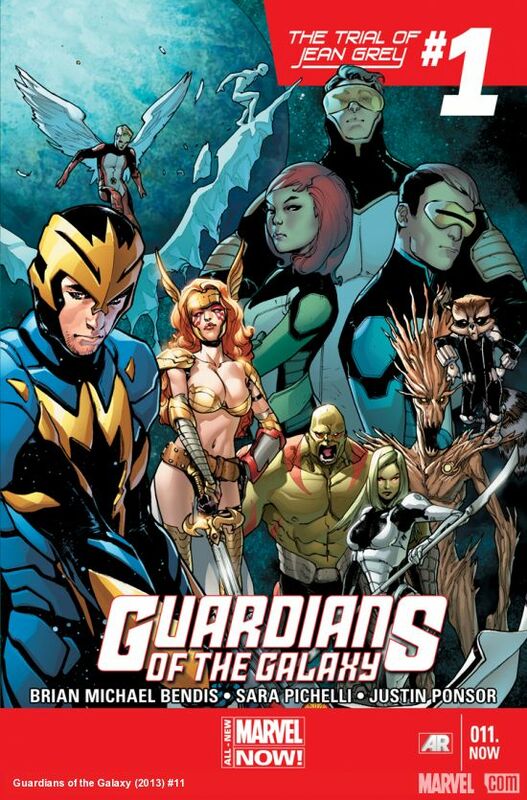 Bendis catches readers up on plot threads involving Star Lord as he tries to fend off a Skrull bounty hunter; Angela and Gamora, who continue their bonding; and Rocket Raccoon, Groot, and Drax, as they bid farewell to former teammate Tony Stark in a particularly hilarious scene. The marketing ploy of teaming the X-Men and the Guardians is a good one because if you have two super-teams with upcoming films why not mash them up? But the crossover isn’t forced as the Jean Grey saga has always had a cosmic element. Bendis clearly understands the Guardians and what makes them special; it’s a pleasure to watch the writer flesh out the soon-to-be movie stars. Sara Pichelli is one of the finest artists working in comics and she and Bendis have a perfect synergy, honed in Ultimate Spider-Man. Her transitions and character work are outstanding, making Guardians a grand, cosmic experience. Agree? Disagree? Leave a comment!